The Standard Model (does not address gravity), which is the fundamental particles and their behavior, is the best understanding that we have of our universe to date. It fills the gaps that previous explanations have left, and hints to the discovery of new laws to fill the gaps that we have right now. 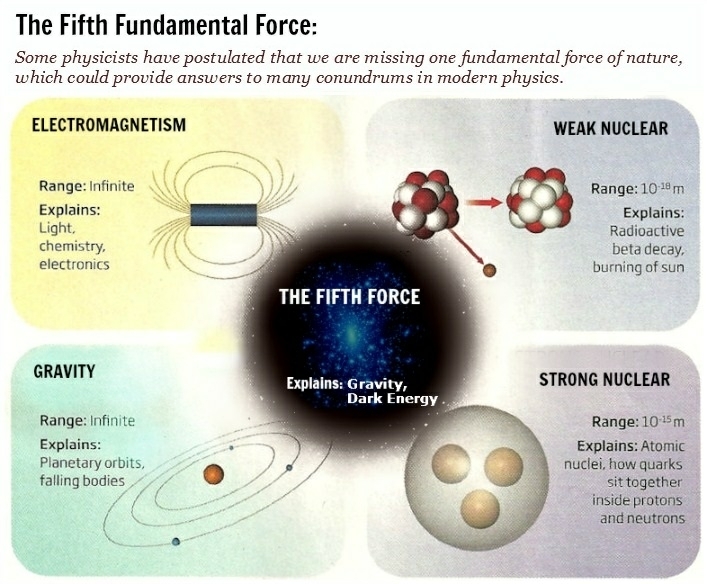 Such hint, is the so called “fifth fundamental force“. In our current theories, we are aware of four fundamental forces. Electromagnetism, Weak Nuclear Force, Strong Nuclear Force, and Gravity. The electromagnetic force is responsible for interactions between charged particles. It extends over infinite distances, and carried by photons which travel at c – the universal speed limit, and the speed of massless particles. The weak nuclear force is responsible for radioactive decay, and plays an important role in nuclear fission. The radioactive beta decay is due to the weak interaction, and transforms a neutron into: a proton, an electron, and an electron antineutrino. Similar to the electromagnetic force which uses photons, the weak nuclear force uses W and Z bosons. The strong nuclear force, is the interaction between nucleons, meaning protons and neutrons, in the nucleus, and uses pions. This force is what keeps them tightly together in the center of the atom. Gravity, or gravitational force, is a force that attracts two objects with mass. To go deeper, it actually attracts two objects with energy, since light (massless) is also bent by gravity. Every object, no matter the size, attracts and is attracted to another object. It is thought to be conveyed by gravitons, but this particle hasn`t been shown to exist. The mightiest of these forces is the strong force, but its range is only the size of the atom nucleus. The weak nuclear force is one-millionth the strength and has an even shorter range, less than a proton’s diameter. The electromagnetic force is about 0.7% as strong as the strong force, but it has an infinite range, since photons that carry it travel at c. Gravity, the weakest of them all, has the strength of about 6 x 10 to the power of -38 that of the strong force, but has an infinite range. The hypothetical particle of graviton must be massless and travel at c. Although it is very similar to the electromagnetic force, gravity is attractive-only. But now there are hints at a mysterious fifth fundamental force in our universe, and physicists have been looking into it for some time now. If discovered, not only would it fill the gaps left by Einstein’s general relativity, but maybe change our understanding of reality to the core! And now, we think we might have the answer on how to detect it. The standard model is neat and carefully structured, but there’s a catch. Like I mentioned in the beginning, gravity is the odd one out. It is the only one of the forces, that we did not yet figure it out how to control and produce. The rest, we can bend them however we desire. Also, studies have shown that there appears to be more gravity than the visible matter is able to produce. The way we explain this gap, is through a placeholder called dark matter, which hasn’t exactly helped its case, because even our best technology can’t find a trace of it. We cannot detect it, except from its gravitational influence. Some physicists recommended to drop gravity from the list of fundamental forces due to this flaw, but others had the idea to be in the lookout for a fifth one that could solve these mysteries. Andrea Ghez, director of the University of California, Los Angeles Galactic Centre Group, is on the hunt for this new hypothetical force alongside her team, and says that the best place to look would be somewhere in the Universe where the influence of gravity is so strong, signs of something extra will be easier to detect. What better place is there in the universe, than the center of our galaxy, where the supermassive black hole around which the whole galaxy rotates around, is residing. By analysing extremely sharp images of the heart of the Milky Way taken with by the Keck Observatory in Hawaii, the researchers can track the orbits of stars near our galaxy’s supermassive black hole. Based on these paths, they can measure the influence of gravity and see if there’s something else at play. Next year, a star named S0-2 will go closer than ever to towards the black hole in the center of our galaxy, and be pulled with maximum gravitational strength. This event, has the team most excited. If there’s any deviation from what the general relativity predicts, this would be the perfect place to spot them. This isn’t the first time that physicists have actively hunted for the fifth force of nature. Just last year, a separate team detected signs of its influence in the energy signature of what appeared to be a new subatomic particle. If confirmed by further experiments, this discovery of a possible fifth force would completely change our understanding of the Universe, with consequences for the unification of forces and dark matter. And even if we don’t end up finding another force of nature at the heart of our galaxy, we’ll likely gain a better understanding of gravity itself – something the standard model of physics desperately needs.